I am Will Anderson, "Blueotter." I would like to convince you to interview me on your radio program. I descend from members of The Wolf Clan... first clan to do everything in Cherokee-way... first in ceremony to eat, first to drink, first to defend the nation, and was first to get dumped by the other so-called Cherokees when these "Cherokeets" hung around the fort just long enough... and ended up with all the tribal lands, federal money, etc... and nowadays to take attention from themselves... they point finger at The Chickamauga: The Cherokee of The Southern Towns and call us "fake." I don't even think so! What an insane world. In March of 1998, just before I woke up one morning, I was told my a voice "2005 will be known in the future as The Year of The Great Havoc, because the weather will become so bad as to possibly shut down all but the highest speed computers on the planet so WAKE UP AND WRITE THAT DOWN." This prophecy has was beginning to be fulfilled as early as September of 2004, which is Jewish and Cherokee new years. In March of 1998, just before I woke up one morning, I was told my a voice "2005 will be known in the future as The Year of The Great Havoc, because the weather will become so bad as to possibly shut down all but the highest speed computers on the planet so WAKE UP AND WRITE THAT DOWN." I was a friend of the most well known medicine man of the modern era whose curative powers were investigated by the Menninger Foundation, John "Rolling Thunder" Pope, or "RT" for short. Leonard Peltier called RT "my medicine man." "RT" was an Art Bell show regular guest before his passing in January of 1997. Red Elk, the world-famous Twisted Hair Society medicine man who is a regular guest on Coast To Coast AM works with us, as does Metis author Robert Ghost Wolf who works closely with the surviving Hopi Sinom, and is another friend of Art Bell, one who has made about 70 appearances on Art Bell Show and Coast to Coast AM. My most recent traditional teacher was John Red Hat Duke of the Original Keetoowah Society. John passed away on 12/30/2003 not long after he commissioned me to put this radio program together. Now that all my original teachers have "walked west," I am an now spokesman for the "White Roots of Peace Gatherings" traditional teachings. My teacher John Red Hat, who was born into the spiritual core (Long Hair Clan) of the spiritual core (Original Keetoowah Society or "Nighthawks") of the Cherokee Nation, may have "passed away" but he is visiting, through spirit, all his old friends giving encouragement. I have published several e-books (a 1000 page trilogy actually) which were actually prophesied by the Iroquois elder and Sachem, Mad Bear Anderson, who founded the American Indian Unity Movement, and was a close friend of my traditional teacher Rolling Thunder. I am prepared to discuss the Catholic, Tibetan, Islamic, Chigaraguan, and other prophecies which ALL PREDICT THREE DAYS (or more) OF DARKNESS SOON! Darkness is also predicted by the famous Hunkpapa Sioux Indian Crazy Horse. I am prepared to discuss the true meaning of the Mayan Calendar 2012 Prophecies... no hype, just the facts from the Horses (Elder's) Mouths. It will "go down" a little differently than most people think it will. I can discuss the REMARKABLE -- but little known -- May 2003 fulfillment of statements made in 1996 by Hopi Elders who are now all dead. I can also discuss the Cherokee/Phoenician/Egyptian/Mayan/Sumerian/Atlantean connections in detail. I am a legally recognized Chickamauga Cherokee Indian, aged 57 years as of December 8th, 2011. I published the first Multicultural/Native prophecy website on the Internet in mid-1996. I am a former Oregon Military Dept. Oregon National Guard Reserve, Emergency Services and Security Branch, State Defence Force training officer, and also a former Country Music front man for a Grand Ole Opry artist. I am well-traveled and outspoken... an alumnus of the world-famous singing goodwill ambassadors "Up With People! "and Up With People High School graduate, the world's only traveling mobile High School. I performed in Carnegie Hall at age 17. Our high school graduation was held in The Baird Auditorium at The Smithsonian Institution. I started shooting a bow at age 8. By age 13, I won my first state championship in the junior age group the State of Mississippi. By age 15, I was a New York State Indoor Intermediate champion archer and out scored all the older men, so I was the defacto state champion. I was Nassau Bowmen club (target) champion in eastern Long Island club champion of the Suffolk (field) Archers in western Long Island. I became a world-class competitive archer at ages 16-18 with almost 30 club, regional, and state championships, as well as placing 10th among the Men's Freestyle division amateurs at the 1971 National Archery Association National Indoor Championships at Harrisburg, PA. At the National Archery Association Championships at Miami, Ohio in July 1972, after the first 36 arrows, I was in 3rd place, 8 points out of first place when I was injured, and was unable to return to archery competition after that. In 1986, Ed Eliason encouraged me to get back into competion because he didn't have any competition in Utah where we both lived. Ed was on the 1972 Olympic Teams and is a USA National champion seven times over. I hold a Bachelors degree from BYU in Non-Profit Agency Administration / Youth Leadership. I worked for the Boy Scouts of America as a District Executive and was the first Varsity Scout Executive in America. I was also a Family Living Instructor at Father Flanagan's Boys Home at Boystown, Nebraska and as a Group Home Houseparent at Youth Homes, Inc. at Rock Springs, WY. I have a warm radio quality voice with a frank -- and sometimes comical -- manner. Red Elk calls me a "Walking Encyclopedia." I was interviewed in 2004 by Shirley Maclaine and that show was aired on July 4, 2004. 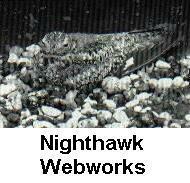 Since then, I have conducted well over 100 interviews here on my on program which is now on BlogTalkRadio every night at 8PM Pacific time. I will be available at the last minute as a fill-in guest if someone else cancels. 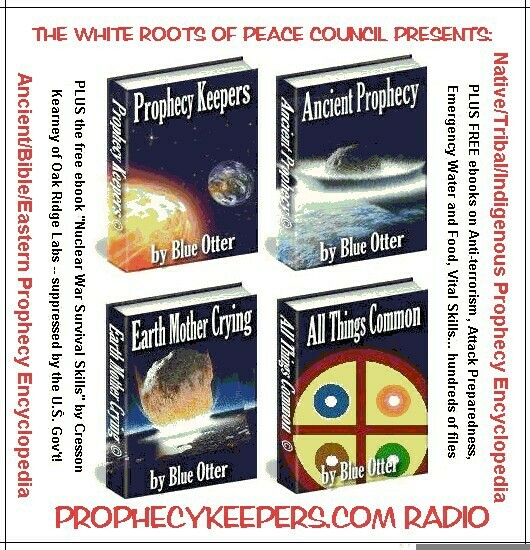 To fulfill BOTH traditional ways AND the mandate of the Hopi Elders to translate these teachings into all possible languages, all our information is available free at http://www.NativeAmericanProphecy.com, or as a $19.99 "purchase-in-support" for lifetime access to our to our extensive AND proprietary "Prophecykeepers Preparedness Library." I will make available PROPHECYKEEPERS PREPAREDNESS LIBRARY PRIZES you may give away on the air, during my appearance, and one that you, the Talent, may "have access to" for production staff -- so they may keep them as a gifts so that you all may become teachers as well. My family missed the May 1998 OK City Tornado by just 1/2 mile, enough to cause me to move them from the city to the rural Ozarks a few years ago to prepare for what is prophesied -- and to help prepare a gathering place for teaching elders and others of good heart. I am legally enrolled in one of the 4 Alabama State Recognized Cherokee Tribes, and am recognized as a citizen of the federally recognized Cherokee Nation of Mexico.